Checking the resting and recovery heart rate of your horse has never been this easy: Just place the Polar transmitter against the horses coat in the prescribed position. 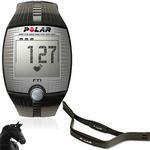 Within seconds you'll see your horse’s heart rate on the Polar training computer. Checking the resting and recovery heart rate of your horse has never been this easy: Just place the Polar transmitter against the horse’s coat in the prescribed position. Within seconds youll see your horse’s heart rate on the Polar training computer.